What do you do when you have family friends from overseas visiting Perth? Well, we take them around iconic places in Perth and of course, we are not forgetting our glorious Perth food! We decided to take our family friends who flew over from Malaysia to Swan Valley. Swan Valley is located 30 minutes from Perth CBD and is very popular for its food scene and wineries. When you visit Swan Valley, your tastebuds will be in for a treat. 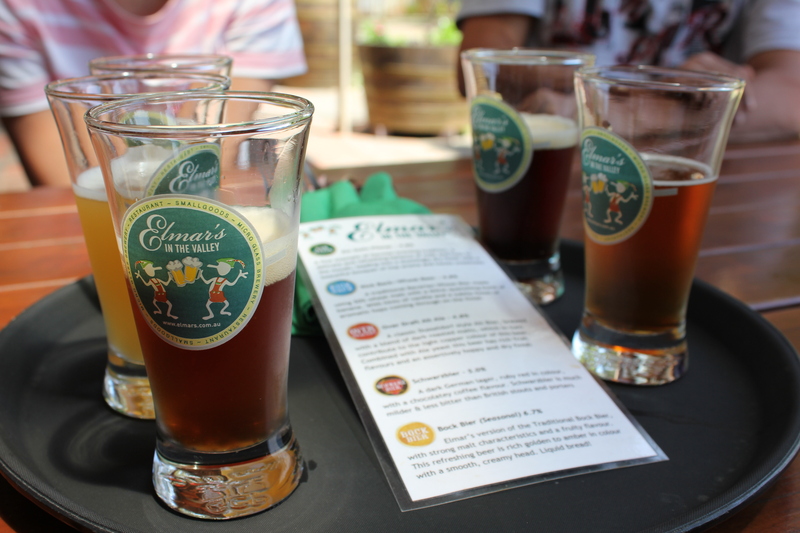 We arrived at Swan Valley for lunch and decided to dine at Elmar’s in the Valley, a german style brewery and smallgoods producer. I have heard that the food served in Elmar’s are decent in portion, so all of us decided to order and share a few dishes. We sat outside under the shade admiring the Swan Valley landscape while indulging in some beer to cool down. It was a beautiful day indeed. For our lunch, we ordered the Large Elmar’s Tasting Plate ($36.90) which consists of Onion Beerstick, Cheese Kransky, Elmar’s Salami, Pork Rillettes, Cheddar Cheese, Cabana, Plain Water Crackers and Rosemary Water Crackers, Gourmet Bread, Pumpernickel and House Marinated Chili Olives. The tasting plate was indeed…large but it showcased a good variety of Elmar’s smallgoods on a plate. 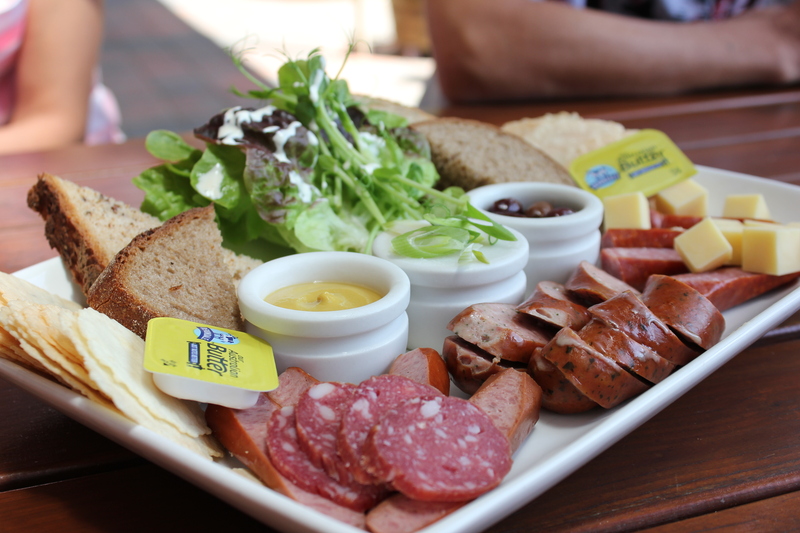 We had the Elmar’s Bratwurst Plate ($36.90). 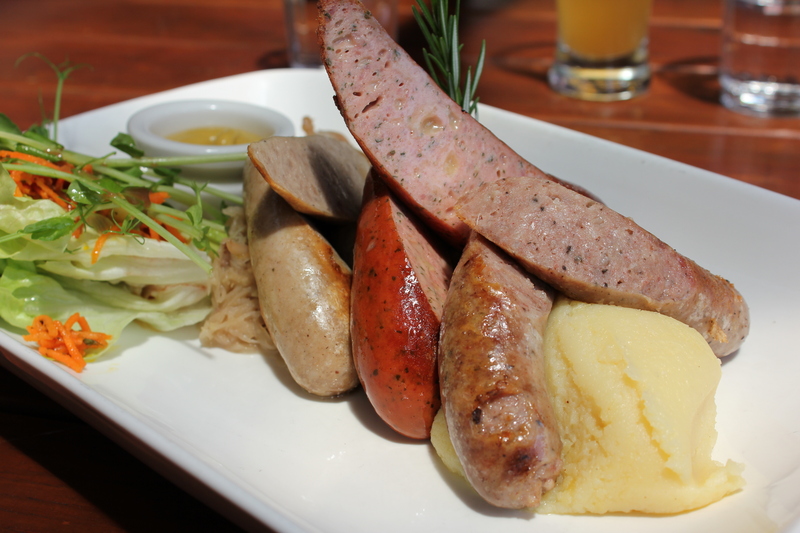 The Elmar’s Bratwurst Plate consists of a trio of bratwurst – Grillbratwurst, Cheese Kransky and Coarse Pork Bratwurst, on a bed of Royal Blue Mashed potato and Sauerkraut served with salad and a side of Mustard. The Bratwurst were all cooked perfectly, full of flavour and blended well with the mustard. The mash potato was the favourite on our table. It was smooth and creamy which is the perfect texture of a good mash potato. 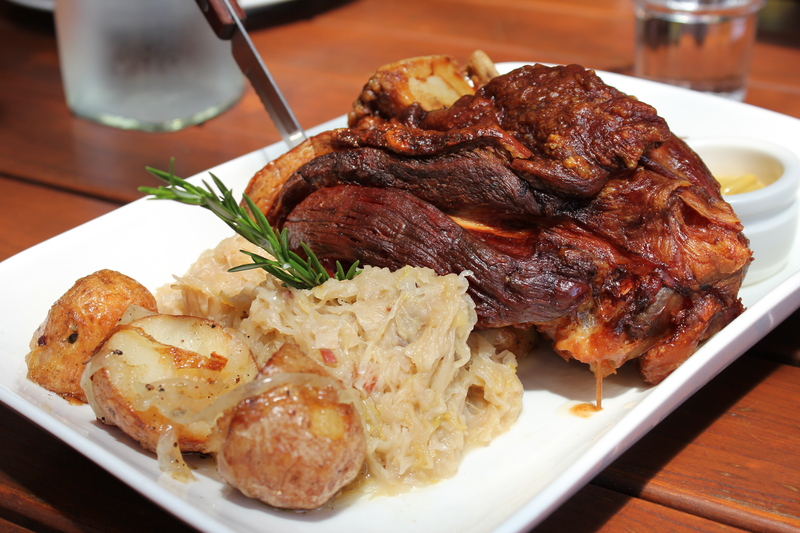 We also ordered the Elmar’s Specialty – Pork Shank (Schweinehaxe) ($42.90) and it was so delicious. Portion, as usual was very generous. The pork shank was very tender and the meat came off the bone easily. It was definitely the winner of our lunch. Overall, our family friends really enjoyed dining at Elmar’s in the Valley. All of our plates were left clean and the pork shank was a clean bone minus the meat. It was a very satisfying and filling lunch that ensured our stomachs will not be left crying for food for the rest of our Swan Valley adventure. We will definitely be back to Elmar’s in the Valley again! For good food, one must be willing to travel the distance.